The recent nomination of the former US ambassador to Baghdad, Zalmay Khalilzad, to a position on the board of DNO, a Norwegian private company engaged in oil deals in Kurdistan, has already generated big headlines. 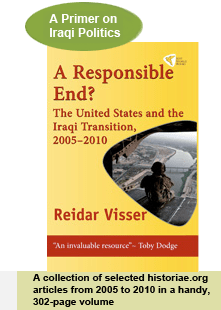 Part of the reason is that following Peter Galbraith, Khalilzad is the second key US figure involved in constitutional issues during the years 2003–2005 to acquire business interests in Kurdistan. Continued disagreement between the Kurds and Baghdad over supremacy and governance issues in the oil sector makes this kind of dual involvement into a particularly touchy area. Certain parallels to Peter Galbraith do exist in this case, but the differences also remain considerable. In the first place, the timing of Khalilzad’s involvement with DNO seems somewhat tidier. Khalilzad quit his diplomatic mission in Iraq in 2007 and his involvement with DNO started after that date (and only became formalised recently after he was nominated for the DNO board by the Emirati company RAK, which has a big stake in DNO shares). Conversely, Peter Galbraith continued to advise the Kurds during the constitutional negotiations in August 2005 even after he had started receiving money from DNO and had also acquired his “stake” in the Tawke oil project. Secondly, to the extent that he is known to have had any direct impact on legal frameworks directly relating to the oil sector, Khalilzad was unsuccessful. Khalilzad failed in his offensive to getting a package of oil legislation passed in early 2007; Galbraith, by way of contrast, was successful in obtaining constitutional accept for many of the principles he authored in late 2003 and early 2004 about regional influence in the oil sector (or at least a sufficient degree of legal ambiguity to create problems for Baghdad). In fact, the parts of the Iraqi constitution with which Khalilzad is most clearly associated are the last-minute amendments that were designed to encourage participation in Sunni Muslim areas in the 15 October 2005 constitutional referendum, including, importantly, the key point about a one-off batch of constitutional revisions with no supermajorities required in parliament (which of course could ultimately reverse everything the Kurds have been dreaming of with respect to regional influence in the oil sector and, in a worst-case scenario for DNO, the business prospects with which Khalilzad has now become associated). The closest parallel to Galbraith is probably the fact that both he and Khalilzad appear happy to continue to advise US public opinion about the best US policy also after their involvement in Kurdish oil. Galbraith’s penmanship in support of some kind of decentralised solution for Iraq has already generated two books (The End of Iraq and Unintended Consequences), whereas Khalilzad just months ago wrote an op-ed in The Financial Times in which he advocated US support for a coalition government consisting of Iraqiyya, State of Law and the Kurdistan list, with Nuri al-Maliki and Ayad Allawi taking turns as premier. This is of course an interesting position, given that in theory, Maliki and Allawi alone actually have a sufficient number of deputies to form a government without the Kurds but that they nevertheless persist in attempts at negotiating with Arbil instead of with each other. This position by Khalilzad on the issue of government formation is also one which is apparently being viewed with interest by the Obama administration. In a recent interview with BBC Hard Talk, Ambassador Chris Hill was asked whether the next government would include the Sadrists (apparently, this scenario is favoured by BBC reporters as the epitome of tragedy in Iraq). Hill replied by saying something to the effect that this was not necessarily the case. “There are four parties”, he began, apparently thinking of the old four-way formula once favoured by the Bush administration of Daawa-ISCI-Kurds-Sunnis, with Iraqiyya apparently serving as “Sunnis” instead of Tawafuq this time. But then he started with the details, first mentioning just State of Law and Iraqiyya, and pausing to emphasise that those parties alone held “almost” enough seats to form a government (they actually have more than enough, but it is good news that this scenario is now at least being considered in Washington). He then mentioned the Kurds briefly (as per the Khalilzad proposal) and moved on to other issues before ISCI (or the Sadrist-free rump INA) was even mentioned. In his commentary on Iraqi affairs, Khalilzad has made it clear that he has a far better understanding of what is going on in Iraq south of Kurdistan than Galbraith, who was always on thin ice whenever he ventured to comment on Baghdad politics. But with his recent involvement as a nominee for the DNO board, Khalilzad no longer enjoys any neutrality on the Iraqi scene: He is effectively a proponent of the vision of a strongly decentralised Iraq that is favoured by those who envisage an autonomous Kurdish oil sector. Any future policy advice on his part about any aspect of US Iraq policy – like the advisability of this or that coalition combination – will be tainted, like that of Galbraith, by business interests that dictate a preference for a weak Baghdad and an oil minister favouring regional interests over national ones.